Well here’s another doggone blog post. Some of you may think Ed. Tap. has gone to the dogs. Truth be told, I’m having trouble getting myself reorganized and this is the only recipe I had handy that was ready to be blogged. I have loads of recipe pictures and lots of recipes I’ve created over the last few months, but none of them seem to go together. I feel like I’m playing that memory game I loved as a kid. The one with all the little cards that you turn over two at a time to match up. I’m confused. I have pictures of Cherries Jubilee Sauce and the recipe, but no finished dish photos. Finished photos of Cheddar Rosemary Scones, but no pictures of the method I used to make them. Raspberry Cheesecake, Indian Fry Bread, Cherry Turnover photos…no recipes. I’m seriously getting concerned. Did I accidentally toss an entire notebook of this summer’s recipes, maybe? I sure hope not! It would take me until next summer to recreate them. That’s what I get for putting my blog on the back burner. Ugh. 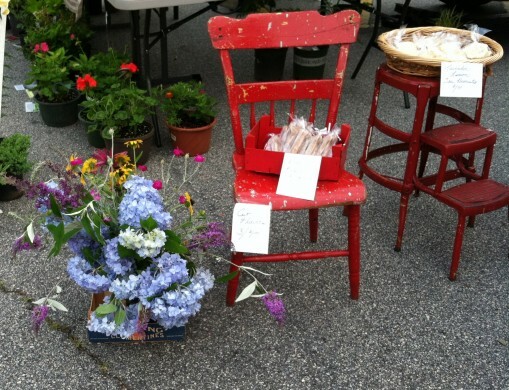 These dog biscuits are probably our biggest farmers market seller. They are made with bacon grease so the dogs that visit the market sniff them out, on occasion, and lead their owners to whichever shelf I have them displayed on. (At snout level if I can manage it.) 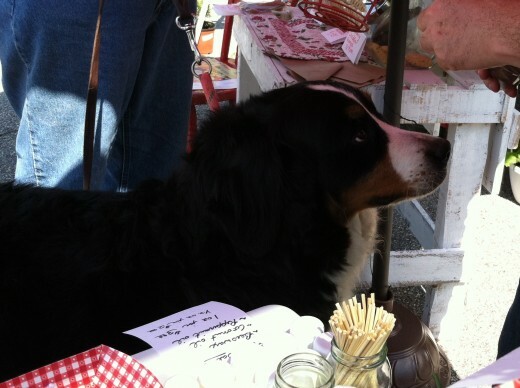 Usually, though, pet owners who haven’t even brought their dogs to the market buy them out of guilt to ensure that they’ve included treats for their puppies with all of their people goody purchases. Seriously. That cracks me up. One lady even bought a bag of the little ones, our Hush Puppies, for her cat. You’d better believe cat treats made with salmon are on our To Do List. Speaking of our bitty Hush Puppy dog treats, there is a little story behind them. My cousin and her boyfriend came to visit from Germany in July. My mother was explaining the market to them in German, telling them all about our Doggi Biscotti when Peter, my cousin’s boyfriend, said in English, “Oh! Hush Puppies!”, confusing them with the fried corn bread we eat with seafood. We told him that hush puppies are something entirely different but thanked him for the idea. 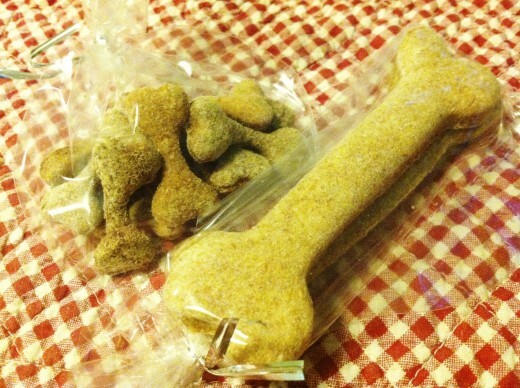 The next week we used our tiny dog bone cutter to make bags of “Hush Puppies”. A great idea that I must credit to my future second cousin in law. Those little things sell like hot cakes!! Some days, however, we see a sweet face (or two) and give out freebie treats. This girl was expecting a huge litter of puppies, six, I think it was. She was given an entire Doggi Biscotti package. Look how politely she is waiting for my husband to unwrap it for her! Adorable. 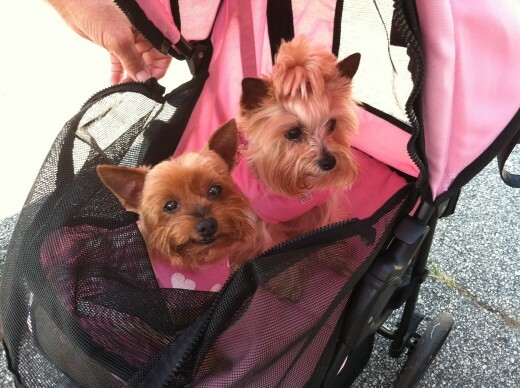 These little ridiculously cute princesses in the pink dog stroller only had to sit around looking pretty to get free Hush Puppies. I almost couldn’t stand to look at them. So cute they hurt my eyes. Their names were Sophie and Kiki…of course. So here is our “secret” recipe for dog biscuits. I should probably keep it to myself, it’s like gold, but don’t mind sharing the love so others can bake them for their furry friends. Work together the flour and fat. Mix in the egg with your hands. Add a little water at a time until a dough is formed. Roll out on a heavily floured surface to 1/2 to 3/4 inch thick. The dough is sticky! Cut with cookie cutters. Lay the biscuits out on a sheet pan. Bake for 35 minutes. Turn them over and bake them for 10 minutes or until very hard. Cool completely before storing in an airtight container. Note: We have come across dogs with wheat allergies, so I suppose you could substitute GF flours for a wheat sensitive dog.